New parents sometimes anticipate their baby's first tooth with a mixture of excitement and worry. While reaching a new developmental milestone is always a cause for celebration, this particular one can come with considerable discomfort. However, teething is different for each baby, and need not be painful at all; plus, there are steps you can take to make the process easier for your baby — and yourself. 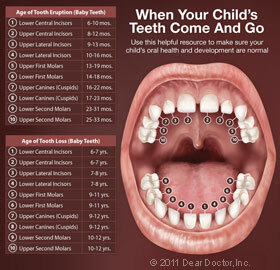 Teething refers to the process by which primary (baby) teeth emerge through the gums and become visible in the mouth. This usually begins between six and nine months of age, though it may start as early as three months or as late as one year. Usually, the lower front teeth erupt first, followed by the ones directly above. 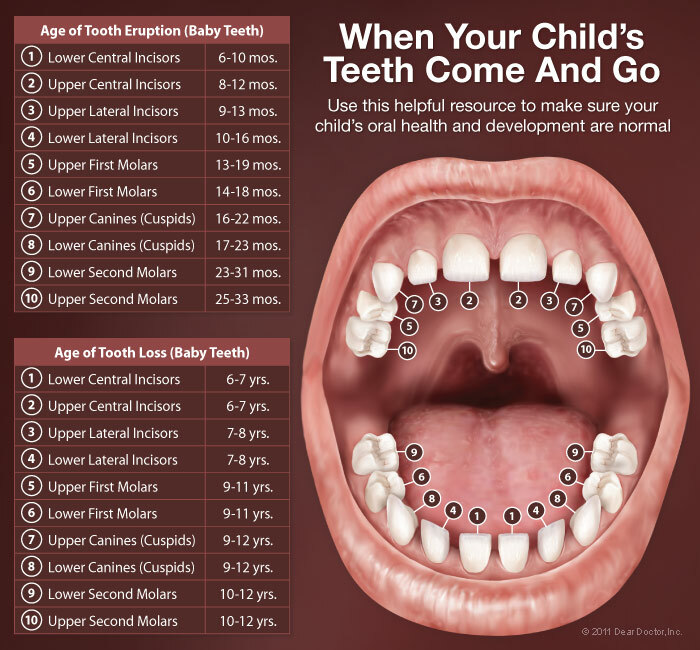 Most children have all 20 of their primary teeth by the age of 3 (View Tooth Eruption Chart). You are most likely to notice any of the above from about four days before the tooth breaks through the gums up until three days after the tooth appears. A less common teething issue is the formation of an “eruption cyst,” a small bubble-like swelling filled with fluid that covers an erupting tooth. Eruption cysts usually do not require treatment as the tooth will simply pop the cyst when it comes through. While there has been some disagreement as to whether diarrhea, rashes and fever are signs of teething, these are more likely to be associated with an unrelated illness and should be reported to your pediatrician. Make sure not to actually freeze your baby's teething ring or pacifier because this could burn if left in the mouth for too long. The outmoded “remedy” of rubbing whiskey or other alcohol on the gums is neither effective nor appropriate. Over-the-counter medication may be helpful, but always check the correct dosage with your pediatrician or pharmacist. These, too, should not be rubbed on the gums because they can burn. Numbing agents shouldn't be used on babies under age 2 unless directed by a physician. Remember, it's best to start dental visits by your child's first birthday to establish this lifelong health-promoting routine (View Age One Dental Visit Video).